If you’ve read my About page, you might remember that I told a little story about eating squirrel. I was born in North Carolina, and though I wouldn’t call my hometown “the country”, my grandmother’s house, where I spent most of my time, butted up against a woodsy area that I don’t think was owned by anyone. It was just “the woods” and it was where I would pick blackberries in the summer and where my teenaged uncle would hunt. On Saturdays he would take his BB gun and venture out to the woods and come back a few hours later with a rabbit or two. My grandmother would clean his catch and cook them up, usually in a simple fricassee. In fact, she actually called it “fricassee” (the first food term I learned) and it must have been her signature dish because it’s the only thing I ever remember her making. The day my uncle brought home the squirrel was forever seared in my memory because I saw it in my grandmother’s 1970s avocado-green sink, skinned and looking very much like a pink rat. I was terrified. My grandmother assured me that it was squirrel (which didn’t make me feel any better) and proceeded to fricassee that squirrel just as she had the rabbits. To this day I remember its tiny bones and how difficult it was to eat, dripping with gravy and commingled with rice. My child-memory leads me to believe that the squirrel’s teeth and claws were in the pot as well but that could have been my imagination (at least that’s what I’m going to tell myself). That was one of the last times I had access to freshly hunted meat, since modern living means easy access to an abundance of familiar proteins found vaccuum-sealed in the grocery store: beef, pork, chicken and the occasional lamb chop. That is, until I received a text message from a good friend one day last week. It was such a random question: “Do you like elk meat?” that I immediately laughed before I responded, thinking a punch-line was imminent. Instead, came the offer of fresh elk meat, recently hunted in neighboring Utah. I had never tasted elk before, but the thought of fresh game was so exciting that I immediately began researching all the ways to cook it. Within hours, I had nearly two pounds of fresh ground elk in my possession. I brought it home, and spent the next few days pondering what in the world I was going to do with it. My internet research told me that elk meat is very low in fat and so care must be taken to cook it quickly without drying it out. I took the meat from its package and sniffed it. The only way I can describe it is that it smelled clean and pure. The color was a deep, dark red with only a few flecks of white fat. I ran it through my fingers and found that it lacked the oiliness of ground beef, which also meant that it didn’t stick together very well. I made a tiny patty, sprinkled it with a little salt and cooked it quickly in a small cast iron skillet. The flavor was purely meaty, but it was distinctly not “beefy”. The only thing I could compare it to was venison, which I’d only eaten once before. 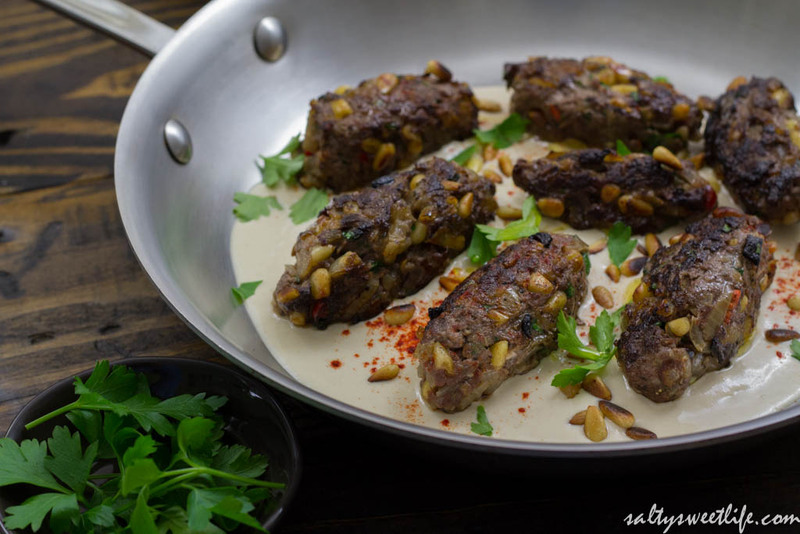 After tasting it, I decided to make a recipe from my Jerusalem cookbook called Kofta B’siniyah. Kofta are meatballs often made with lamb or beef or a combination of the two, mixed with onion, garlic and spices and shaped into “torpedo-like fingers”. Elk seemed like a perfect vehicle for the bold spices–cinnamon, allspice, nutmeg. Since the meat had already demonstrated that it lacked the sticking power of fattier meats, I made some adjustments. Normally when I make any type of meatball, finely chopped raw onion is added to give the meat flavor and moisture. Since this meat should not be overcooked and I planned to keep it medium-rare in the center, I decided to sauté the onions first, until they were a deep golden brown before adding them to the meat. That way, I was free to cook the meatball quickly and not have the unpleasant bite of raw onion. Sauteéing the onions in olive oil allowed me to add some healthy fat to the meat, hopefully helping it to stick together and also giving it a little more flavor. Shaping the kofta was a little bit difficult due to the fact that the meat was so lean, but a gentle squeeze and some time in the refrigerator helped them to hold their shape. Still, care had to be taken to keep them from falling apart while being cooked. I seared them, sizzling in hot oil until they had a nice brown crust, which only took about a minute for each side, then let them rest. I served them with a tahini-lemon dressing and drizzled a little more olive oil over the top. I’ve heard people describe game meat as, well, “gamey” but I really don’t have a clear understanding of what that actually means. I’ve also heard people say that lamb is “gamey”, but I just think that lamb tastes like lamb–rich and round. To me, elk just tasted like good, fresh, lean meat. The end result was a tender bite, medium-rare in the center and very moist. If there was any “gaminess” it was obscured by the spices. The Husband wanted to taste more of the meat without the spices and in hindsight I should have saved a plain patty for him to taste as a comparison. All things considered, I’m pretty glad that my earliest food memories involved skinned squirrels and rabbits in the kitchen sink, because I may have missed out on the opportunity to experiment with a protein that was truly unfamiliar, unexpected and delicious! I made these kofta with fresh ground elk meat so I was confident that it was handled and dressed properly by the hunter. Regardless of the type of meat you are using, it’s best to grind it yourself or have the butcher grind it for you. 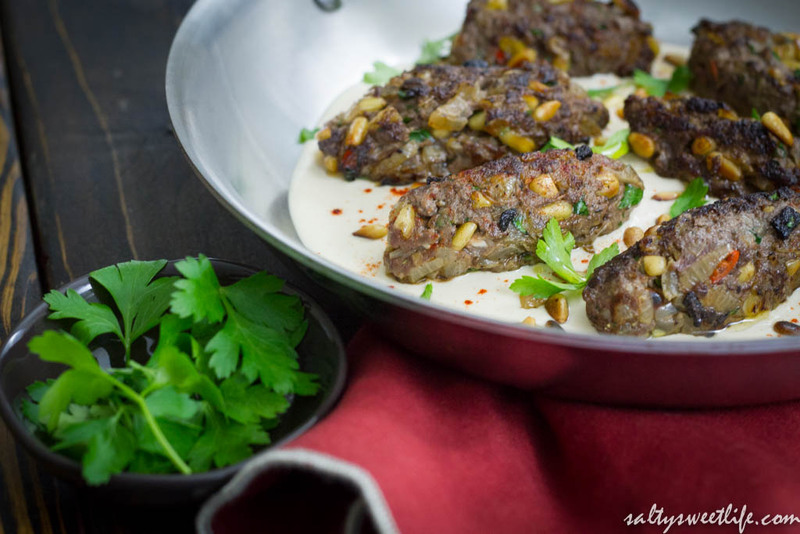 Serve the finished kofta immediately with a drizzle of olive oil or melted butter if desired and in a generous pool of the tahini sauce. I feel like I’ve been making tahini based dressing more and more these days and I really love it. The slightly smoky flavor of the tahini with the brightness of the lemon juice balances the meat quite nicely. 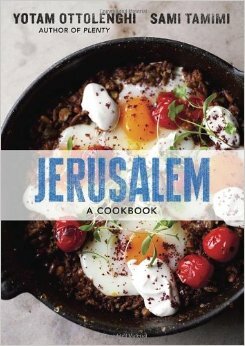 Recipe inspired by and adapted from Jerusalem, A Cookbook, by Yotam Ottolenghi and Sami Tamimi. Heat two tablespoons of olive oil in a sauté pan and add the chopped onion. Cook for 15 to 20 minutes, until the onion has completely softened and is the color of maple syrup. Allow the onions to cool a few minutes and add to a mixing bowl with the remainder of the ingredients for the kofta. Use your hands to thoroughly mix the ingredients. Spoon about 1 1/2 tablespoons of the mixture into your hand and shape into a small torpedo. Make sure you squeeze the kofta enough that they hold together well. Place the shaped kofta on a baking sheet and place in the refrigerator for at least 30 minutes. In a small mixing bowl, whisk the tahini paste, lemon juice, garlic, water and a pinch of salt. The mixture should be slight runny. If it is too thick, add a little more water until it is pourable consistency. Heat two tablespoons of sunflower oil or Meditteranean blend in a frying pan over medium hight heat. Add the chilled kofta and sear on each side until golden brown. If using elk, only cook for 1 to 2 minutes on each side. If using lamb or beef, cook for about 6 minutes total. 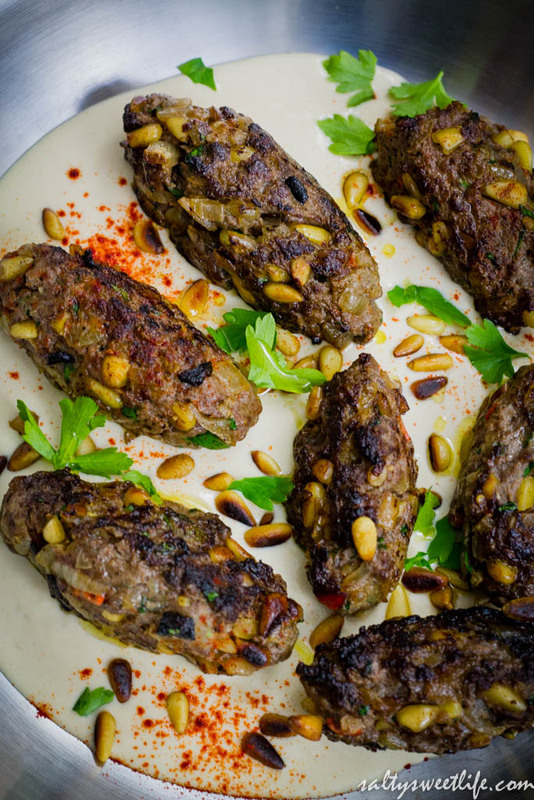 Remove the kofta and place them on a baking sheet. The kofta will be medium rare at this point. If you want to cook them longer, place them in a 425 degree oven and cook for an additional 2 to 4 minutes, being careful not to overcook. 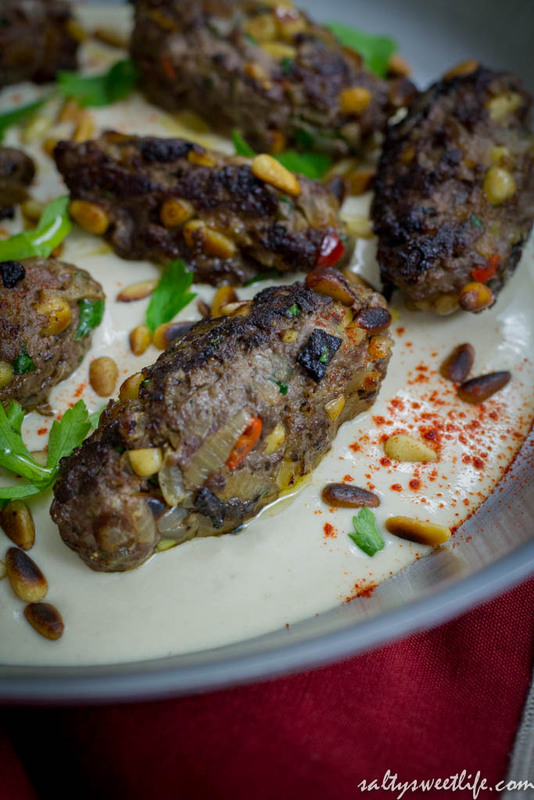 Spoon the tahini sauce around the kofta and sprinkle with additional pine nuts, chopped parsley and paprika. Drizzle with a little olive oil or browned butter if preferred. Serve immediately. Hey Dana! Yup, I kinda like the sound of that! 😄 I hope you’ll get the opportunity to try some elk–it was fun to experiment with it! I’ve never had squirrel but I have rabbit probably twice year, I love It fried and smother in peppers and gravy. This looks beautiful, I ‘ve never had Elk but I’m curious after reading your post Tracey! Christina, I have not been able to find rabbit in the regular store, but a speciality butcher in town has them. I keep meaning to get some because I really like rabbit, too! You should write up your recipe, because it sounds delicious! You’re not missing out on that squirrel though (brrr). I’m not sure if I’m ready to step outside of my comfort zone with Elk but this recipe sounds amazing. I bet it’s nice with some tender lamb, huh? Hi Charlene! Thanks so much for stopping by! Yes, ground lamb would be absolutely perfect. The original recipe called for half lamb and half ground beef. I’ve had a lot of wild meat. Elk to me is as you described it. A pure meat flavor. Venison on the other hand is what I might think of as gamey. Your Kofta came out gorgeous! Julie! How are you feeling? What other types of wild game do you enjoy? I am happy you agree with that description because I had the hardest time coming up with the right words to describe the flavor! You are right–it just tastes clean! The venison I had did not taste gamey to me–it was just rich and delicious, but we had it at a fancy restaurant. So glad to see you and that you liked this one! It was tough to photograph!